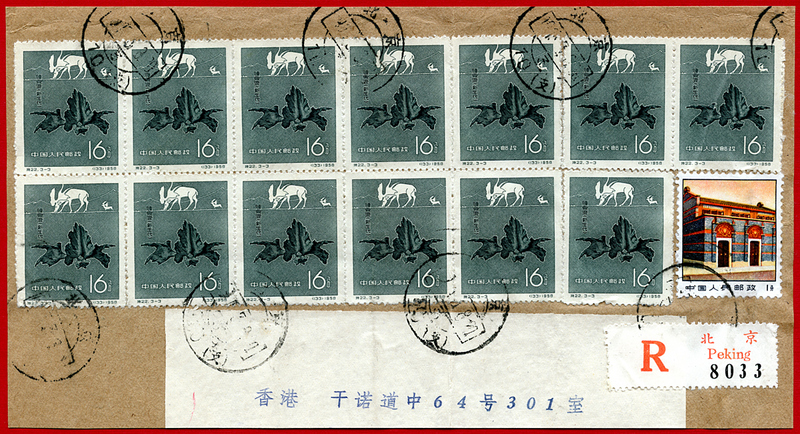 One of the earliest sets to capture the interest of philatelists with a paleontological bent was from the People’s Republic of China (mainland). The set was issued on April 15, 1958 and the three values depicted a trilobite, a dinosaur and the Pleistocene Chinese elk (Sinomegacerus eurycerus) respectively. This package wrapper was posted from Peking (now Beijing) and sadly, the cancellation is too incomplete to read the date. The wrapped uses 13 copies of the 16 fen stamp with make-up postage (1 fen) paying a surface rate with registration. The total is 209 fen (100 fen equal 1 yuan). This entry was posted in Mammals, Paleo-Postage, Pleistocene and tagged People's Republic of China postage, Pleistocene Chinese elk, Sinomegacerus eurycerus. Bookmark the permalink.